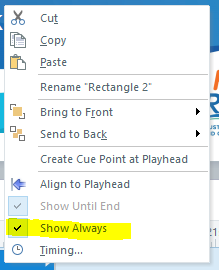 I am trying to figure out what happens when I select "Show Always" in the right click menu for an object in the timeline. When I right click an object, such as a shape or button, check "Show Always," and preview, it appears to do nothing. I am expecting the selected object to show always, which I understand to mean it will appear on every slide. Can anyone tell me what this does? And/or how to use it correctly? I looked all over for that and couldn't find it, thanks. Was I ever off on that one. It basically means "show from beginning." I guess it was that word "always" that threw me off. Hi there--I'm trying to get my callouts to remain on-screen for the duration of the slide's action (even after each gesture is complete) so it will stay on the slide long enough for learners to view it. However, this function doesn't seem to work properly, even though the Show Always setting appears in the timeline (with arrows pointing both ways). Not sure what I'm missing? No worries Michelle :) Can we get an update on your findings? Were you able to get this resolved? Is there any way to get an object or button to show continuously throughout a scene or even a whole module? Have you tried putting it on the master layout? The one problem you might have there is if you want it to be in front of other objects, because objects on the master are always on the bottom. In that case, you have to create it and copy it to each slide. AFAIK, Storyline has no mechanism to allow a persistent foreground element. It would be a extremely useful to float a [character, audio, button bar, progress bar, logo] ABOVE the course, for the duration of the course. Storyline cannot. The master slide won't do it; no master slide element can overlay other slide elements. I sent this feature request down the black hole for 5 years. It's available in Captivate. I wanted to mention you can add an object to a layer on a slide master. Then add this trigger to the base layer: "Show layer when the timeline starts on the slide master". The object will then overlay anything on the base layer. It may not be exactly what you're looking for, but hopefully that gets you closer to your goal! "Hi John this is the explanation from the tutorial"